In early Hinduism, Varuna (from the Sanskrit root vr, meaning "to surround") was a Vedic solar god who, in Hindu mythology, presided over the celestial ocean surrounding the earth. In ancient India, he enjoyed supremacy over the Vedic pantheon as the god of the universal law/moral order (rta), though he was eventually usurped by Indra, the god of storms. Ancient Hinduism differentiated deities into two classes: asuras and devas. Originally, the asuras were elevated to the rank of sovereign gods and classified as Adityas, or sons of Aditi ("infinity"). Varuna was the most prominent of these gods. As time progressed, other members of the Vedic pantheon, the subordinate devas such as Indra, Agni and Soma, would eventually eclipse Varuna in importance. The eventual rise of the devas to prominence lead the asuras to be seen as demonic. The etymology of the name Varuna is uncertain, though it may follow from the Sanskrit root vr, which refers to the act of enveloping. The name may also derive from the Proto-Indo-European root *wer- or *wel-, meaning "to cover." As a theonym, Varuna likely dates back to the Indo-Iranian age, although no Iranian continuation of the name has survived. Inscriptions that have been dated from the fourteenth century found in Bogazkoy, Turkey suggest that Varuna derives from Uru-Van-nas-sil, a Mittani deity prototypical of later sky gods. The Mitanni names aruna and urvana may refer to a similar early Indo-Aryan god. Cognate names of gods in other Indo-European languages have been linked to Varuna, including most notably Uranos (Latin: Uranus), the early sky god in Greek mythology, Vörnir, a giant of Norse mythology (from *verunyos), the Slavic god Svarog, and also velnias, the Lithuanian term for "devil." However, most of these connections are tenuous at best, and have been seriously contested by linguists. Based on his place in mythology, Varuna has also been connected to Poseidon in Greek mythology or Neptune in Roman mythology, as each of these gods presides over large bodies of water. Varuna came to supremacy as a celestial god in the Vedic pantheon by supplanting the elder god Dyaus. His ascendance to this position above the other gods is not surprising, considering the importance of sky gods among the Aryan nomads. As chief of the Adityas, Varuna possessed aspects of a solar deity. He alone allowed the sun to shine on the firmament, representing the 'dark' side of the Sun as it traveled back from West to East during the night. Varuna developed to become the god of the night sky exclusively, with the constellations representing his holy actions, and the moon moving by his will alone. The stars were also said to the represent his many eyes, or spasa. This term spasa later came to mean "spy," and thus these celestial eyes were seen as representative of his spies who oversaw the moral actions of humanity. After further linguistic development, the word came to mean "noose," no doubt in connection to the noose Varuna was said to possess in order to ensnare sinners. Varuna has extended the air above the trees; he has put strength in horses, milk in cows, will power in hearts, fire in waters, the sun in the heaven, and soma upon the mountain. No creature carries on without Varuna. His incomprehensible wisdom is further illustrated in the act of initiation of his son, the sage Rishi Vishishtha, into the shruti, the esoteric knowledge which fills the Vedas and is only available to the spiritually advanced. There are no limits to Varuna's knowledge: he knows of a hundred thousand medicines to heal any affliction, and foresees all destinies. Early on, Varuna also grants wealth to his devout followers and protects cattle. He is also reponsible for steering the safe course of ships across water, which may foreshadow his later status as monarch of the terrestrial waters. In the Vedas, Varuna is not directly connected to water, but instead represents water as it is present in the elements of ether and earth. He dug out the riverbeds, which flow by his command. Further, he sees to it that rivers, when entering into the ocean, does not cause overflow. It seems that Varuna was heralded as the supreme divinity in the Vedic religion for only a brief period. In the Rg Veda, he was frequently referred to by the title samraj, or "emperor," a title which was rarely used to refer to more popular gods such as Indra, who would eventually rise to unquestioned supremacy over the rest of the pantheon. Further, in the ritual prescriptions, the Rajasuya sacrifice was carried out for the sole purpose of elevating personal status. This sacrifice is said to belong to Varuna (as well as Mitra) who most likely performed it himself with the intention of rising to supremacy over the rest of the gods. Despite his supremacy in the early Rg Veda as omniscient and omnipotent sky god, Varuna's ascendancy through the whole of the work is not particularly evident when compared to other gods. Throughout the Vedas, Varuna is mentioned 341 times, while Indra, chief of the Devas, is mentioned approximately six-fold that. This may misrepresent the actual importance of Varuna in early Vedic society due to the focus of the Rigveda upon Agni and Soma ritual, and the close relation between the Soma ritual and Indra. What, Varuna, hath been my chief transgression, that though wouldst slay the friend who sings thy praises? Tell me, unconquerable Lord, and quickly sinless will I approach thee with mine homage. This passage illustrates another important aspect of Varuna's moral authority: through sin he keeps human beings mystified. Although humans know of his jurisdiction over moral precepts, they do not know what these precepts are specifically since his moral law remains undisclosed. Thus, Varuna maintains control over humans by binding them with precepts of his own determination and emancipating them with his grace. This function as a judge of morality and bestower of forgiveness seems to be the sole source of Varuna's power, as he has no other outstanding qualities or acheivements attributed to him in Vedic myths. Although Varuna himself would fade out of currency, his principles would live on, as rta came to be understood as dharma in later Hinduism. Varuna maintains rta with help from Mitra, the Asura who originally represented oath personified. Together Varuna and Mitra are the gods of the oath, and are often identified together as Mitra-Varuna. Mitra represents the human side of Vedic religion, which is based in ritual contracts. Varuna, in contrast, is the sovereign of the cosmos, at once terrible and magical, omniscient and omnipresent. Along with Mitra, Varuna is called the lord of light. I, Varuna, am king...I, Varuna, am Indra [too]. While at first the two deities cooperate, signs of impending conflict are evident early on in the Rg Veda, as the two gods are clearly of opposite character. For example, while the gods fight together to destroy the malevolent Dasas, Varuna fights by way of his panoptic vision, while Indra lays low and attacks covertly. Later on, Indra becomes Varuna's rival, and the two grapple for supremacy over the universe. This struggle may parallel the actual social strife between the Brahmin and Kshatrya castes in ancient India, as Varuna represents the spiritual qualities typically attributed to the former group and Indra embodies the militaristic values of the latter. Varuna is the king by divine right, just as the Brahmins are the highest caste by birth. Indra, like the Kshatryas, rules because of conquest and fortitude. Indra eventually overtakes Varuna, just as Varuna overtook Dyaus at the genesis of Vedic mythology. In doing so, Indra also assumed control over the rains, which had formerly been under Varuna's jurisdiction. Regardless of the fact that Varuna guards justice and truth, he maintains an intriguing ambiguity of character through his reliance upon on guile and trickery (maya) in order to carry out many of his functions. With maya, Varuna effortlessly carries out such tasks as providing rains and rivers, while Indra or the Maruts do the same with considerable stress and turbulence. Varuna uses his magical power of maya in order to create the numerous forms of the universe, as well as his own form. Varuna's relationship with maya came to link him with the demonic traits that the asuras later embodied. Varuna was closely related to chthonic gods such as Yama, Soma and Rudra. 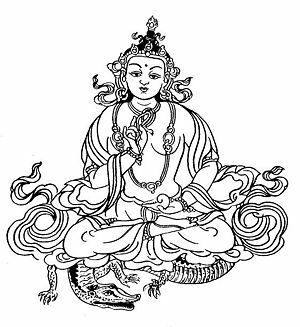 Varuna himself is described as Mayin, or crafty, as a result of his possession of maya, and is therefore approached with much trepidation. As such, his forms often embody Rudolph Otto's godly attributes of mystery, tremendousness and fascination. That is, Varuna is generally associated with baleful beings such as snakes, barren cows, and other ugly creatures. As the Vedas progress, Varuna's role as the ethical overlord gradually diminished. Just as in the case of Poseidon in Greek Mythology, the territory under his jurisdiction was restricted to the celestial waters. Post-Vedic literature includes Varuna only in the role of a minor character. In the epics and Puranas, for example, his domain became more limited, and he is said to have ruled over rivers, lakes and streams, although his primary dominion was the ocean, under which he was said to live in a royal palace. He was also conceived of as keeper of the souls of the drowned, bolstering his role as an underworld deity, as he now became a god of the dead with the power to grant immortality. Later art depicts Varuna as a white man wearing golden armor and holding a noose or lasso made from a snake. Further, an impenetrable cobra's hood forms his umbrella, which is named Abhoga. He rides the sea monster named Makara, which was often sculptured on buildings with a prominent gaping mouth. Originally, Makara was a fish, though he was later represented by an aquatic serpent or a crocodile. By the time of the later Puranas (800-1200 C.E. ), Varuna's acknowledgements became minimal, and usually only in his position as one of the “Guardians of the Directions.” He represents the west, another affirmation of his relation to darkness. As ruler of the Western ocean, he represented the origin of the rains which blow into India during the monsoon season. By this time, as a lord of only a quarter of the Earth, or dikpala, he had been fully relegated to the position of a passive god. Although Varuna fell out of importance in later Vedic religion, he left a lasting impression upon the Hindu traditions that followed, as the participation of human beings in the span of an orderly cosmos became an enduring aspect of the Hindu faith. Furthermore, rta, the cosmic order which he upheld, would develop into the concept of dharma in later Hinduism, which became an indispensible idea to virtually all branches of the faith. In contrast to the Indian tradition, Iranian mythology amalgamated the asuras into one all-encompassing deity, Ahura Mazda, and reduced the devas to the level of demons. Ahura Mazda is the supreme deity of the Avesta, the Zoroastrian holy book. While the name Varuna did not persist in Iranian culture, Varuna in his function as keeper of the cosmic order resembles Ahura Mazda. For example, Mithra is twinned with Ahura Mazda in the Avesta just as Vedic Mitra is related with Varuna. Further, the Avesta also connects Varuna with the Iranian equivalent of the rishi Visistha. Here, Asha Vahishta is one of the Amesha Spenta who assists Ahura Mazda in carrying out his will on earth. Such evidence bolsters the argument for Varuna's Indo-Aryan origin. Bhattacharji, Sukumari. "Varuna" in Encyclopedia of Religion. Edited by Mercia Eliade. New York: MacMillan Publishing, 1987. pp. 189-191. Zaenher, R.C. Hinduism. New York: Oxford University Press, 1962. This page was last modified on 29 August 2008, at 16:00.